I don’t know if I should be excited or concerned with a $1.19 flight. 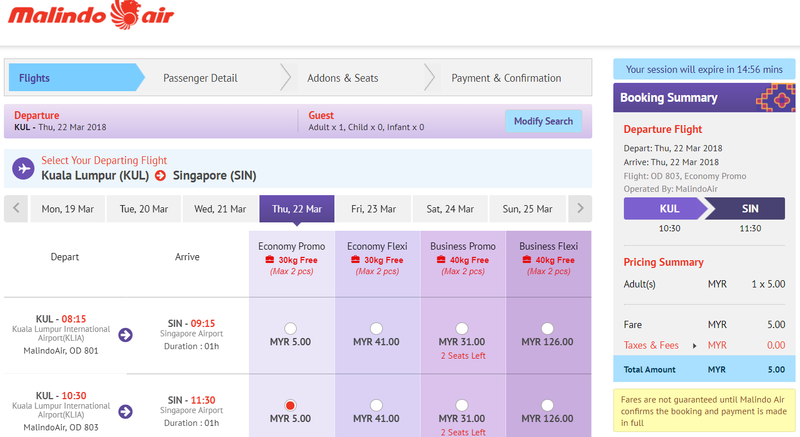 Malindo Air is a Malaysian carrier with great deals throughout SE Asia, this is certainly no exception. There are a number of dates in 2018 with this insane pricing of 5 Malaysian Ringgits. At 5 MYR it converts to $1.19 USD. You can fly from Kuala Lumpur to Singapore for the cost of a spicy chicken at Carl’s Jr. The funny part is that your cost of public transportation to the KUL airport will be more than the flight. If you want to fly the opposite direction, there are a number of flights at $10 on Malindo during the same date range. With most short-haul carriers in SE Asia, baggage is extremely limited. With Malindo Air you are permitted to bring 30kg’s even with the cheapest fares. That is 66lb’s of stuff to bring along. Malaysia’s flagship carrier Malaysia Airlines matches Malindo’s baggage allowance but charges far more for the same flight.